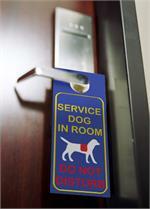 Great way to let staff know that you have a Service Animal in the room and to not disturb you. 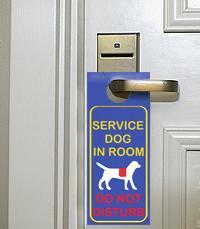 Perfect for hotel rooms, motel rooms, resorts, cruise ships, or anywhere that you do not want the housekeeper, or other staff knocking or opening the door. Have peace of mind while in your room. 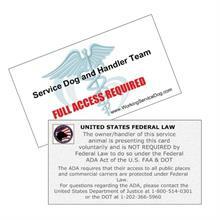 Printed on a 100 pound glossy cardstock (simular to a glossy postcard) - reusable and affordable if stolen, damaged or lost. Measurements: 3 1/2" x 8 1/2"